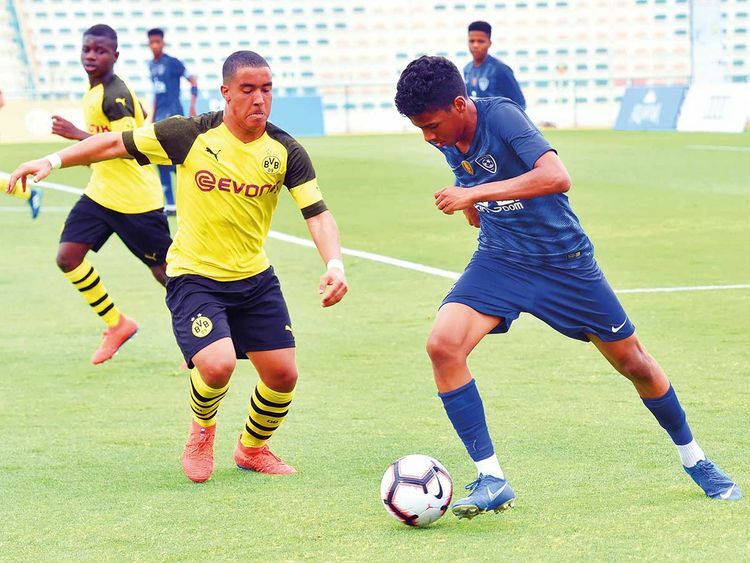 Dubai: Former champions Al Hilal of Saudi Arabia scored two quick injury-time goals to leave German giants Borussia Dortmund ruing biased refereeing and missed chances on the opening day of the Ninth Dubai Under-16 International Football Championships on Wednesday. Heading towards full points while leading 2-1, Dortmund’s dreams for a winning start took a jolt in the 91st minute when Mohammad Al Dossari connected a free kick for the equaliser, and then a minute later substitute Abdullah Hadi Radif converted from the penalty spot following a foul inside the area. Till those last few minutes of extra-time, the Germans had the match under control with Dominik Wasilewski cancelling out Fahad Ziad Sa’ad’s 12th-minute opener in the 35th minute to go in tied 1-1 at half-time. The early part of the second half belonged to Dortmund with Leart Tahiri converting a penalty in the 59th to give them the lead. However, he hit the post with his second penalty two minutes later — a miss that would come to haunt his team in the end. “This game belonged to the referee. He made the decision to give that penalty against us that I feel was more than a joke. I am a bit angry because our boys are all crying because we feel that every decision in the last 15 minutes went against us,” Dortmund coach Karsten Gorges rued. “We still have two more matches and we have to target maximum six points if we want to advance to the semi-finals. We need to put this match behind us and learn from the experience. I firmly believe that a referee is allowed to have a bad day, but that shouldn’t be at the cost of losing a game under such circumstances,” he added. Champions in 2016, Al Hilal were more than thrilled with the three points especially after landing in Dubai in the early hours of Wednesday after defeating Al Nasr in the local derby on Tuesday. “It was a crazy match no doubt, and we are more than happy to take the three points. My players were fatigued, but they gave a great account of themselves,” Al Hilal coach Carlos Inarejos said. “We have just started and the best is yet to come. We have another two group matches and we will need to do better than this,” he added. In the second match, Shabab Al Ahli Dubai brushed aside cross-city rivals Al Wasl 3-0 with Hareb Abdullah, Hamdan Hassan and substitute Ebrahim Al Hammadi getting the goals. “We are really happy with the result, but we need to put this behind us and focus on the next match,” Shabab Al Ahli Dubai coach Khalid Mohammad, said. “Every match in this tournament is like a final for us and we have to win two finals to reach the semis, and then try to win two more. We are determined to become the first UAE team to win this tournament,” he added.